Ray Binns is an internationally-recognised geologist with special interests in the formation of Australian mineral deposits and their associated rocks. He initiated, and led from CSIRO, a highly successful frontier research program of marine expeditions and laboratory investigations focused on actively-forming mineral deposits on the deep ocean floor near Papua New Guinea. Ray Binns was born in Sydney in 1937 and educated at Fort Street High School. 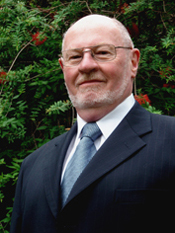 He graduated BSc in 1959 at the University of Sydney with the University Medal in Geology and Geophysics. In 1962, he was awarded his PhD from the University of Cambridge in the field of Mineralogy and Petrology for a thesis on the Broken Hill region, NSW. Returning to Australia he taught geology at the University of New England (1962-70) and the University of Western Australia (1971-77) while conducting research on a variety of Australian igneous and metamorphic rocks as well as meteorites. He joined CSIRO in 1977 as Assistant Chief of the then Division of Mineralogy based in Sydney, where he led research programs on exploration concepts and technologies at a number of Australian mineral fields. He returned to full-time research in 1985 and in 1986 conducted the first of many marine expeditions aimed at discovering and understanding seafloor polymetallic sulfide deposits, the modern analogues of a major ore type exploited in ancient geological sequences of Australia and other continents. The program was supported by a consortium of Australian mineral companies who applied the outcomes to their land-based exploration strategies. The resultant discoveries included several that proved uncommonly rich in valuable metals and which have attracted commercial activity aimed at exploitation. Following retirement in 2002, Ray Binns has continued research on seafloor minerals as an Honorary Research Fellow in CSIRO Exploration and Mining and a Visiting Fellow at the Australian National University. He serves on the Scientific Advisory Board of Nautilus Minerals Inc., the company preparing to mine the CSIRO seafloor discoveries near Papua New Guinea, and on other company strategic advisory committees. His geological consultancies have involved participation in a number of commercial marine expeditions. Ray Binns initiated a highly successful frontier research program of marine expeditions and laboratory investigations focused on actively-forming mineral deposits on the deep ocean floor near Papua New Guinea.